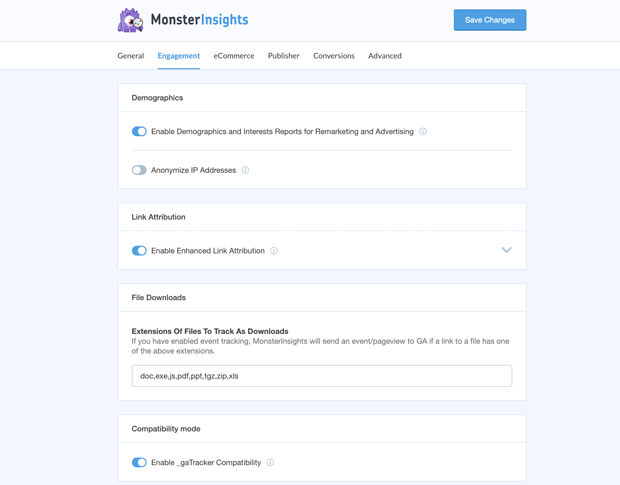 Today, I’m proud to announce MonsterInsights 7.4, our first release of 2019. It comes with a lot of exciting features that you’ve been asking for including a brand new setup wizard, MemberPress integration, improved affiliate link tracking, and more. It is our mission to make Google Analytics easy for WordPress sites, so you can get the stats matter and grow your business. Our brand new setup wizard, makes MonsterInsights even easier than it already was. 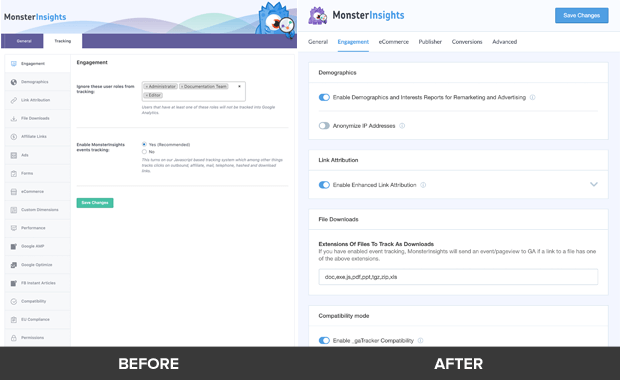 Now when you first install MonsterInsights, you have the option to use our five-step setup wizard to properly add Google Analytics on your WordPress site. It starts by asking you the category of your website. Based on your selection, our setup wizard recommends optimal settings for MonsterInsights. With our new setup wizard, you can setup Google Analytics on your website like a Pro (in less than 5 minutes). With MonsterInsights 7.4, you will notice a brand new settings panel that’s not only simpler, but extremely FAST. We redesigned the settings panel based on user-feedback to better organize and simplify the options that are available. Over the years, we added a lot of tracking options and features which made our old settings panel difficult to use. The problem was that our settings were divided based on features and addons instead of actual use-cases. The new settings panel is organized based on solutions which offers a much better user experience. Aside from ease of use, you will notice that the new Settings panel is extremely fast. That’s because our dev team used Vue.js programming language which offers significant performance improvements. If you make money from your blog using affiliate links, then you’re going to love our improved affiliate tracking feature. One of the big reasons why bloggers love MonsterInsights is because we make it easy to track all outbound links in WordPress. This helps you uncover new partnership opportunities. Our old affiliate tracking feature also made it easy to track your custom branded affiliate links, but the problem was that you were limited to only one prefix (i.e /go/ or /refer/). With our new improved affiliate tracking, you can now define multiple internal paths to be tracked as affiliate links. This is extremely helpful if you’re using an affiliate link management plugin like Pretty Links. If you run a membership site using MemberPress, then you are going to love this integration. MemberPress is one of the most popular membership plugin for WordPress. 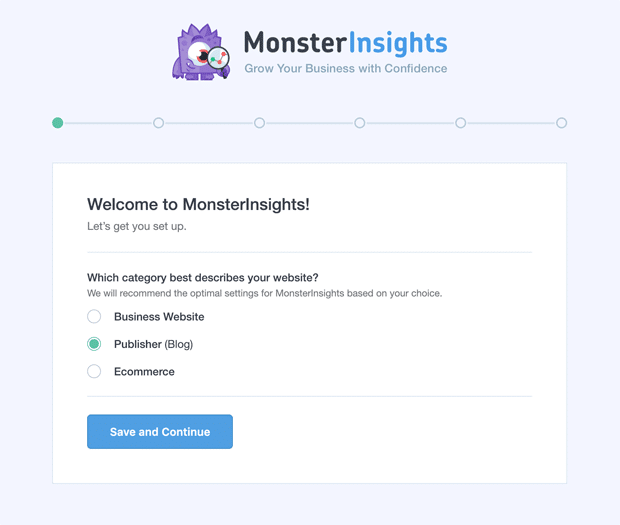 That’s why in MonsterInsights 7.4, we have built an Enhanced Ecommerce Integration for MemberPress, so you can grow your membership site with confidence. Google Analytics Enhanced Ecommerce tracking allows you to see important eCommerce metrics like total revenue, conversion rate, average order value, top products, top referral sources, and more. Now you can get all your important store metrics right inside your WordPress dashboard in a single report. All you need to do is enable eCommerce tracking inside your Google Analytics account, and then install the MonsterInsights Ecommerce Addon. Once activated, MonsterInsights will automatically add the right tracking tags to your website, so you can have your eCommerce tracking data within minutes. No need to spend hours configuring Google Analytis Ecommerce tracking. MonsterInsights does it for you, with just a few clicks. We hope you enjoy these features. We have a lot more in the works that I can’t wait to share with you in the upcoming weeks.